Cole Slaw is one of those things that many people think is healthy because it contains so many colorful vegetables (cabbage, carrots, etc). However, a lot of cole slaws have so much mayonase and/or sugar that the disadvantages of this high fat, high calorie dish outweigh the benefits of all those tasty vegetables! There is, however, no denying that a nice cool scoop of cole slaw can really tie a whole BBQ plate together. So I decided to try and make my own, sans sugar or mayonase. I thought it would be a chore to chop all that cabbage and carrots, but it wasn’t bad. And if you have a food processor it is even easier. 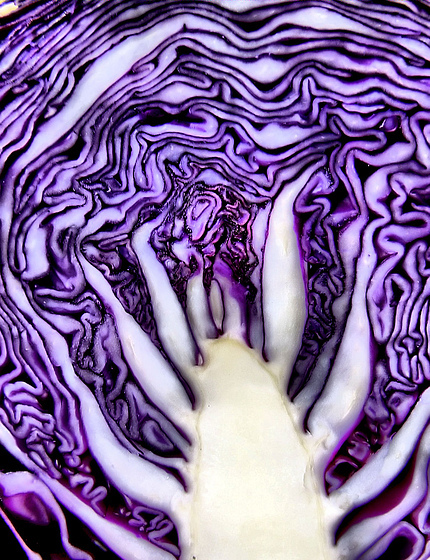 I still prefer to cut my cabbage with a knife, because I enjoy the bigger pieces of cabbage, but everyone is different. The most efficient way I have found to cut cabbage is to (after washing and discarding outside leaves) cut the cabbage in half, then quarters. I then cut out the core and cut the quarters in half again. I then lay the eights on a flat edge and slice pretty finely the cabbage, starting from the pointy ends. It literally takes probably 5 minutes. Carrots, unfortunately, you have to grate, which is a bit messy and time consuming, but not too bad. For the sauce, I used Dr. Fuhrmans Sesame Ginger dressing with tahini and added a bit of honey (to make the cole slaw sweeter) and some apple cider vinegar. The recipe sounds complicated, but it really isn’t. Plus, if you double the batch and save some in old plastic containers you will have a lot readily available. I even save old mustard and other such squirt bottles and then funnel my home made sauces and dressings in. Call me frugal, but they work well. After you chop and mix all the veggies, pour as much of this sauce as you want over your slaw. The Dr. Fuhrman book says this is enough sauce for 4 servings if that helps. I used about half of what this recipe made, then added about 2 tbsp of honey and splash of apple cider vinegar and mixed that into the cole slaw. 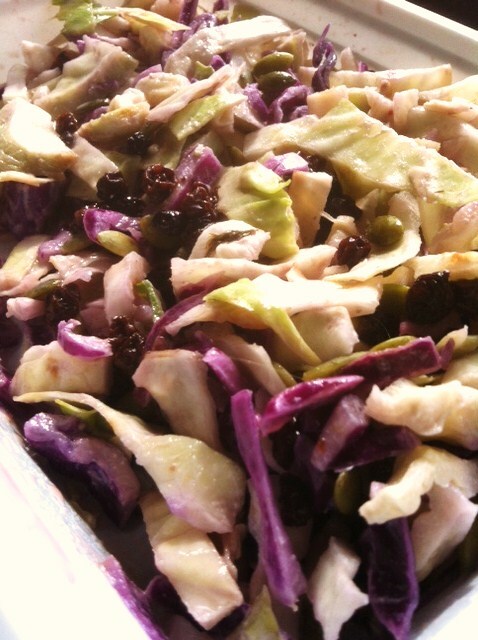 I then topped my cole slaw with pumpkin seeds and currants for a bit more sweetness and added crunch. I only had my iPhone and poor lighting for the photo so you can’t really see them, but they’re there! Just one bite and you’ll know ;).